For fifty-eight years my father had no official given name. 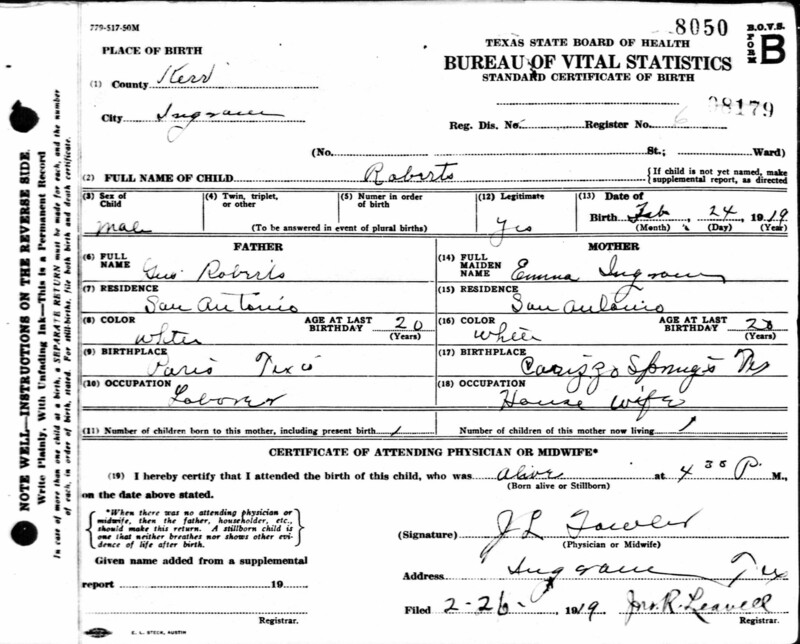 He was simply “Roberts” on the birth record tucked away in Kerr County, Texas. Genealogists love birth certificates! They’re informative, sometimes puzzling and can even be intriguing. Like his father before him, Burton Lee Roberts had to go back many years later to the county of his birth and have his certificate amended. What can we learn from the birth certificate of B.L. Roberts? Some birth certificates are incomplete. Birth certificates provide facts and clues for the diligent family historian. Birth certificates are not always correct. Birth certificates are always specific to a person. The blanks are not always filled in and when they’re not, the certificate is incomplete. In the enhanced image of my dad’s certificate there are several blank spaces. These include the specific address of his birth and his given name or names at the time of his birth. On the space after “FULL NAME OF CHILD” there is simply the word “Roberts”. This would remain so until it was amended in 1977. On other certificates, I’ve seen the space for the father’s information left blank. When it is, the blank under the term “Legitimate” is often left blank or filled in with the word “No”, but not always. When you find a blank on a certificate, ask yourself, why it’s blank? The answer may or may not be obvious. The answer may or may not be that significant. Some documents are better sources of information for specific needs. Keep this in mind as you do research. I like death certificates for the date of death better than a headstone and I like birth certificates to establish the date of birth better than a headstone. Yes, I know, I wish we could always find one too! Whatever you find that provides evidence for your work, remember, the information is only as good as it’s source. If the mother is the source and she doesn’t know where her husband was born, the information will most likely be incorrect. Birth Certificates provide facts. 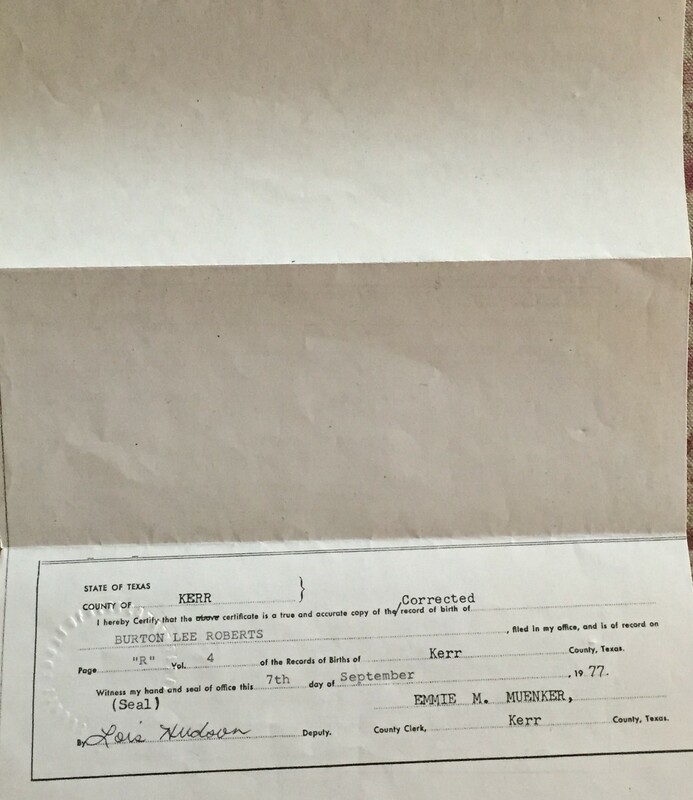 On Dad’s certificate we learn he was a male child considered legitimate and born on February 24, 1919 at around 4:30 pm. His father was Gus Roberts a white male living in San Antonio, TX aged 20 years on his last birthday and was born in Paris, Texas. His mother was Emma Ingram a white female living in San Antonio, TX aged 20 years on her last birthday and born in Carrizo Springs, Texas. Gus is a laborer and Emma is a housewife. The attending physician was J.L. Fowler. He lived in Ingram, TX. The Kerr County Clerk at the time was Jno. R. Leavell. Dad was the sixth birth registered in Kerr County! Birth certificates may also provide clues. 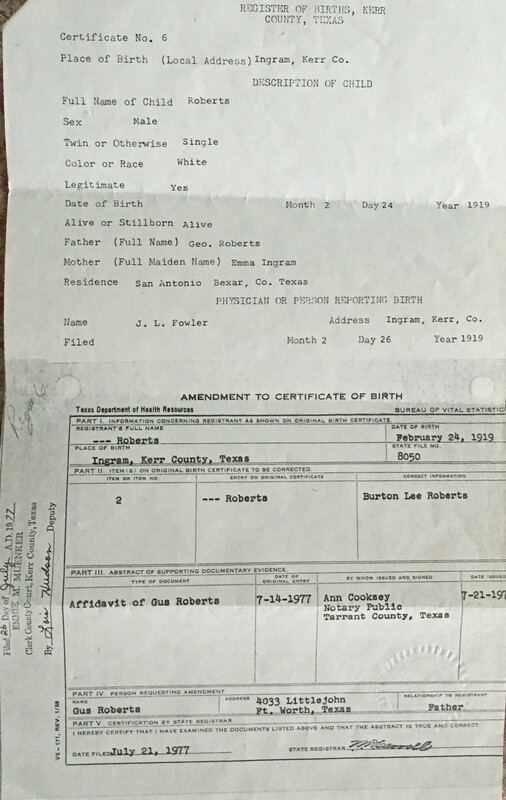 Dad’s certificate states his parents’ residence at the time of his birth was San Antonio, but his place of birth is given as the city of Ingram in Kerr County. What’s up with that? Were they on a trip when she went into labor? That’s possible. We know they resided in San Antonio, Texas on or near the time of Dad’s birth. His father worked for Otis Elevator and when he filled out a World War I draft card he and his wife Emma lived on Nebraska St. in San Antonio. We know Emma’s mother lived in Ingram, TX. (If we hadn’t, Dad’s certificate would have been a good clue.). That’s about 85 miles west of San Antonio. We know other Ingram girls (Also Emma’s maiden name) delivered their babies while visiting their mother in the town of Ingram. Here’s where another clue is presented to us. Why was there no given name on Dad’s original birth certificate? Perhaps his mother had traveled to Ingram from San Antonio weeks or even a month before Dad was due. Perhaps his father was in San Antonio working and not in Ingram when his first child arrived. This may explain the missing given names on the certificate. Perhaps Dad’s mother wasn’t sure what her husband wanted to call his son. As previously stated, birth certificates are only as good as their source. Therefore they’re not always 100% correct. Be aware. Having said that, they’re still our best source for an accurate birth date. While my dad’s original certificate is incomplete, it appears to be accurate with the information it provides. That’s not totally true about the side notes attached to the amended certificate. I believe Dad and Mom must have decided to get an official birth certificate on the same trip to the Texas hill country, Dad’s from Kerr County and Mom’s from Bandera County. They were both in for surprises. Dad discovered he didn’t have a given or middle name. Mom discovered she was a year younger than she thought she was. I wish I could have seen their faces. How does someone in their late fifties not need an official birth certificate before then? How does someone in their middle thirties lose track of their age? Dad would later obtain an affidavit from his father and return it to Kerr County in order to amend his birth certificate. Here’s a photo image of the amendment. The top part of the document is the clerk’s recording of what she sees in the original document. The bottom part is the amendment to the original document. Here’s where I suppose Dad officially receives his full name Burton Lee Roberts. Burton was after Burton Cheesman, the husband of his mother’s sister B.G. They were very close. Lee was his mother’s middle name. My dad would later name his firstborn David Lee Roberts. But not all of the information on this amended document is correct. The clerk misread the original and put down the father’s name as “Geo.” rather than “Gus” in the information she recorded at the top the the page. 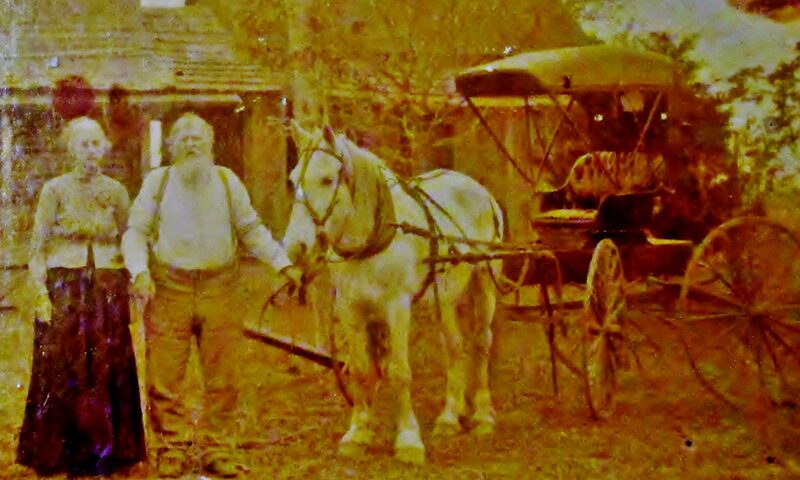 So, if you’re looking for a George Roberts living in Texas during the early part of the 1900s, here’s your “proof”. (I type laughing.) Add it to your family tree! The next image is the photo of the back of the previous image and dates when the amended certificate was recorded in Kerr County. These are useful photos of two documents containing wonderful information about Burton Lee Roberts. I’m grateful to have them and seek to collect birth certificates for all of my family research subjects when they’re available. I’m sure you do as well. One more reason these are so valuable to me, some people still question my dad’s birth date. He did this to himself. He joined the army when he was sixteen but lied about his age to do so. He has a military birth date of February 24, 1917 and an actual birthday of February 24, 1919. Confusing? Sometimes. But that’s why we do reasonably exhaustive research. Happy backtracking! Please signup to follow our blog and Facebook page. Let us know about some of your birth certificate discoveries.